Another morning of me being wide awake at 2am -__- I really do hope this isn’t a continuing trend! I did eventually fall back to sleep, but woke again at 5am. Hubs was awake too, so we decided to get ourselves ready for our 9:10am character breakfast at Tusker House, Animal Kingdom. We ate there on our first trip in 2011 and it was brilliant! Great food and the character meet and greets were fun too. Sat nav decided to be a complete donkey and took us to the wrong place again. Sure, it took us down Sherberth Road, but couldn’t quite take us to the entrance…so frustrating! Quite frankly we had a crap ton of problems with this particular sat nav on this trip and next trip I don’t think I’d even bother with one, I know my way around now and don’t have n00b nerves any more! We paid our $15 to park and was directed to Unicorn Lot, which is within walking distance of the entrance to the park. Off we trotted to go through security and bleep our way into Animal Kingdom at around 8:30am, not before, of course, a few photographs! I will warn you now, this report has LOT of photographs! It’s pretty cool to be allowed into a park before the rest of the crowds and for me, being able to take a few pics without people walking in front of me was sheer bliss! I just love Animal Kingdom for all the natural surroundings and the little details. Just like Magic Kingdom yesterday, I could just as easily spend a day walking around this park not doing any rides! As we walked over the bridge towards the Tree of Life, I spotted this gazebo for the Wilderness Explorers. I don’t remember it last time, but it looks like a fun thing to do with children as you go around the park. I think next time I’ll be a big kid and pick up the booklet to fill out and stamp as I go around! Then there is the magnificent Tree of Life, which is huge! There are things in Walt Disney World that I take a lot of photos of – this is one of those! We continued our way through to Africa, enjoying the quiet of the park, and before we knew it I could hear people – the gates were open and I suggested to hubs to go over to Kilimanjaro Safaris to grab a Fastpass to use after breakfast. That was the same tactic we deployed on our first visit! With the Fastpasses obtained for a good hour or so after our breakfast start time, we checked in at Tusker House and waited in line to meet Donald Duck! The cast members were happy to take a photo of us with Donald on our own camera, as well as the official one that they take and then sell to you at your table which (we did buy again this year, $35.10). After our photo op, we were shown into the restaurant. It was very full when we entered, and therefore pretty noisy as well. We were sat at the back in the corner of the room and after being poured some juice, Goofy made an entrance. We waited for him to visit our table before heading to the buffet. …and then it was breakfast time! The food at Tusker House is very good – lots of choice…allow me to introduce the buffet to you, because, for us, it is the best breakfast in Orlando! The buffet area is set out like a market place. The desserts are in the middle and the savoury stuff, around the edges. OMG MICKEY WAFFLES! Ahem, there are Mickey shaped waffles with maple syrup (the thing I go and have Disney breakfast for! ), eggs, bacon, sausage patties, potatoes, fritatta…all really delicious. The boy’s favourite are tater tots! Hubs…well, he’ll eat pretty much anything as long as there isn’t coconut in it! But he does have a thing for the cheese blintzes and made sure he served himself up a plate of those before anything else! I didn’t take a photo of the African food section of the buffet which includes bobtie, which I can best describe as a spicy meat fluffy omelette, yam casserole, and a spicy hash. They also have a carved ham which always looks really tasty, but I’ve not found the room to fit in! And finally, desserts…for breakfast. The banana-cinnamon bread pudding is amazeballs – I save room for that and advise you do the same! Whilst it defies logic to be eating pud for brekkie, just do it – you will not be disappointed! There are also assorted pastries and donuts – of which, first trip out, I took a couple extra and popped in a food bag for a snack for us all later on. By the end of breakfast we were all too full to think about food later in the day – eyes too big for our belly! The last character visit was from Daisy Duck, who made no more than a pit stop to our table before moving on – how rude! Pfft, she doesn’t deserve Donald! After that, the restaurant emptied out and I mean really emptied out – we were the only table left in the room! At this point, Goofy came back to strut his stuff and do a little dance, which was hilarious! He is truly as bonkers as a box of frogs! After this entertaining interlude, we paid our bill ($99.02 plus tip) and headed over to Kilimanjaro Safaris for our Fastpass return time. The wait time for the safari was 20 minutes, which isn’t actually that bad, but there is something quite satisfying bypassing a line with a Fastpass! We stepped into our safari truck and off we went on a bumpy animal spotting adventure! We saw lots of different animals…hippos, giraffe, ostrich, elephants, rhino to name but a few. I do love this ride. For those that need a size guide, it’s a bench seat with no restraints…just hold onto your hat! I don’t remember seeing warthogs last time…it’s true when they say it’s never the same safari twice! And it’s not just the animals that give you something to look at, the scenery is wonderful too. We then walked through Pangini Trail, and rather than rush our way through like I am sure we did on our first trip, we took our time – which is the one thing I just loved about this second visit to Orlando. This guy here is one of the stops for the Wilderness Explorers. I had a little chat with him as he was playing a djembe drum, which my friend plays! We entered part of the trail where there were lots of birds – not a place to visit if you fear our flying friends. There was a cast member there with a whistle and every so often he’d blow it and all the birds would come fluttering over…it was a wonderful sight. Moving way too quick for me to catch any decent photos of, and any I did take were promptly deleted when I looked at them later in the day! …and then we entered the section where you could view the gorillas. One was sleeping soundly (and comfortably!) in the corner. There was also a baby gorilla who was playing about in the dust. Somersaulting all over the place he was – so, so funny and I’m pretty sure he knew that he was being quite the entertainer! Hubs took some video, but I’ve not had the chance to upload it yet – I will do as soon as I can! I love this photo I got of him because it looks like he’s got a right laugh on his face! Moving on, and over the bridge, we spotted the big silverback up in the distance – gorillas are just stunning creatures, I stood there and watched him for about 10 minutes. Festival of the Lion King was the next thing on our (not written down, but in my head) agenda and so we headed back through Africa to go to the theatre. I wasn’t in a major rush though, as didn’t want to be hanging around in the queuing area which is hot and crowded. We took a moment to have a sit down, drink some water and spray some suncream, and Liam and I were lizard spotting! As we got up to move onward, there were some African guys setting up for some musical entertainment, we had time, so hung around to see what would be going on. It was brilliant to watch – I love the sound of African music already, and being in this atmosphere made the music sound even more awesome! The dancer at the front then started pulling people out of the crowd to dance along with him. Much to Liam’s embarrassment, he was one of those people! But, he was a good sport and joined in, which I was pretty surprised about! Kinda glad I wasn’t pulled up though, my zumba skills have gone down hill! A year ago I would have rocked it! As the group finished their act, the crowd dispersed and we headed towards Festival of the Lion King. 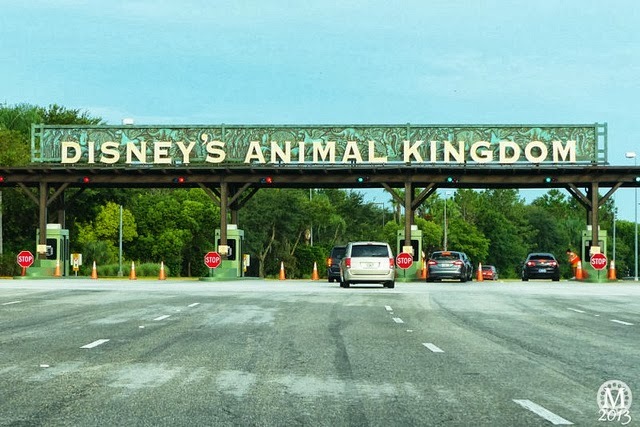 I’ve been told that it is going to removed from Animal Kingdom – not sure how true that is, but if it is, it’s a travesty – it’s a wonderful show. Festival of the Lion King is not like watching the film or the stage show – it doesn’t follow that story, but it does use the musical score, and if you, like me, love the songs from The Lion King, you will love this. The singers have great voices and everyone in the show is full of enthusiasm. Part way through you have the monkeys tumbling and trapeezing all over the place! And then there is this guy with fire sticks! ‘Wow’, is the best word to describe that! With two gorgeous songs – ‘Can You Feel the Love Tonight’ and ‘Circle of Life’ being my favourite from The Lion King, I often wipe away little tears when I hear them! This performance was no different! The show closes out with a medley of all the songs, and it’s a real hand clapping, toe tapping affair! Just brilliant, a must see show. With the show over, we scooted out of the theatre and straight towards Camp Minnie Mickey, which, on our last trip, we missed going to. Fortunately, the crowds went off in other directions and the lines for meeting the characters was relatively short. We joined the queue for Baloo and King Louie first, as we really wanted to meet these guys! Whilst waiting in line or hanging around this general area, there is a guy with a guitar walking around singing Disney songs, so helps to while away the time! Lots of hugs and messing around with these two characters – King Louie was high-fiving and low-fiving me, thinking he was going to pull his hand away, I pulled a switcheroo on him and put my hand out for a low-five instead…but pulled it away just as he was about to clap. He stomped his feet and walked off down the path all upset! Awwwwwww…I had to go after him and give him a big kiss so he’d come back and pose for a photograph! We then lined up to meet our favourite of favourite characters – Chip ‘n’ Dale ♥ They were as awesome as ever and so much fun. Finally, it was time to meet Donald Duck in his safari gear. …and a little bit more scenery, before heading towards It’s Tough To Be A Bug. On the way, we noticed the Russell and Doug (from the movie Up) were doing a meet and greet and the line was short, so we joined it – new characters for us – have never met these guys before! High-fives and hugs and stealing of my hand fan were common themes when meeting characters on this trip! Exactly what happened with Russell and Doug! I love how that, even if you are grown up, or have an older child with you, characters still make the effort! It also depends on how much you want to interact with them, we always have a blast when meeting them around Walt Disney World! After meeting Doug and Russell, (Doug is the dog, just in case you haven’t see Up!) we walked down the looooong pathway to It’s Tough To Be A Bug. Lots of lovely scenery down here as well as close up carvings from the Tree of Life. The show was just about to start as we got to the entrance, so we grabbed our bug eyes (3D glasses) and went into the theatre. We were only a few from the front, which for me watching 3D is not the best of places. I don’t feel you get the effect when you’re that close up – but then, it’s probably my eyes! We do love this attraction – informative, but funny and also, if you have little kids that are afraid of the dark – quite terrifying! I know that they warn you that there are periods of darkness etc, but I heard little kids screaming in terror…eek…so be warned. Being close to the front also meant being a bit choked by the smoke that is released during the show, so just be wary of that when picking where you sit – further back and the smoke dissipates. It really is amazing how time flies when you are in the park, by now it was mid afternoon and we grabbed a spot to watch Mickey’s Jammin’ Jungle Parade. This was cancelled on our last trip because of lightning, and because of that, it was on my Disney bucket list for this year’s trip. It did not disappoint! It was fun to watch and seemed to go on for a long time! I liked that it wasn’t the usual floats that you get on the parades, and everyone in the parade looked like they were having lots of fun. I would like to know how you get to be one of the families on the float? That’s being added to my bucket list! And now, for lots of photos of the parade! Right, I know that this has been a super long trip report – not many words, but lots of photos (I did warn you!) but we are coming towards the end of our day at Animal Kingdom! Thank you for reading this far! Just as Mickey’s Jammin’ Jungle Parade was coming to an end, it started to rain lightly; we decided to keep going and head over to watch the Finding Nemo musical. We went past Dinoland USA which is an area of the park we didn’t explore on our first visit, and sadly, we didn’t on this visit either! I did take a couple of snaps of things I did see as we continued round to the theatre. We stopped at a merchandise cart because I spied these cute Disney baby plushies, and we bought one for our two nieces – baby Pegasus and baby Dumbo – so cuuuuuuute! …however, after sitting down for about 10 minutes, hubby told me he wasn’t feeling very well. I asked if he wanted us to go, and he said no, it would be okay. But, as the show is quite long I put my foot down and said we should leave, it wasn’t fair for him to be sitting there feeling horrid, so we dug out the ponchos and braved the rain to walk towards the exit. We have seen the Nemo musical before, so it wasn’t the end of the world to miss it. It may feel like we didn’t do very much at Animal Kingdom – but we managed to fill a whole day! We didn’t even make it to the Asia section and therefore we still didn’t ride Expedition Everest…next time maybe?! The rain didn’t last too long and by the time we were back at the car, we could take the ponchos off. A drive home and dinner in the villa rounded off our third day in Orlando!